Subaru Cherry Blossom Festival welcomes Zenkaikon Entertainment, Inc. to Sakura Sunday! Zenkaikon Entertainment, Inc.’s Zenkaikon is an annual anime & sci-fi convention held in Lancaster, PA. Now in its 13th year, Zenkaikon hosts panels, workshops, gaming, screenings, and much more! 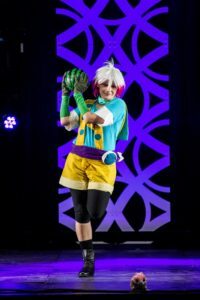 In addition to running Zenkaikon, Zenkaikon Entertainment Inc. hosts the Cosplay Showcase and Cosplay Fashion Show events at Sakura Sunday, giving participants an opportunity to share their hard work and passion with the audience. See your favorite animated characters live in person on the Main Stage at 11:45 AM, and on the Little Akiba stage at 1:00 PM! Zenkaikon is an annual convention in Lancaster, PA celebrating anime, comics, games, science fiction, and fandom! Learn more by visiting their website and checking out their facebook page! Subaru Cherry Blossom Festival is proud to announce the new Budding Talent program on Sakura Sunday! Budding Talent is an all-ages talent show featuring performers from the Greater Philadelphia area. Up to ten local and up-and-coming musicians, singers, dancers, cosplayers, and more will showcase acts that tie to Japanese popular culture and will compete to win prizes – along with the glory of being crowned Best Bud! Come to the Little Akiba Anime and Cosplay Stage at 2:00 PM to watch the show.